Here is the latest white-light solar imagery taken from Al Sadeem Observatory, February 4, 2019. The sky was mostly cloudy with intermittent light to moderate winds which provided average to poor seeing and transparency at the time these images were taken. 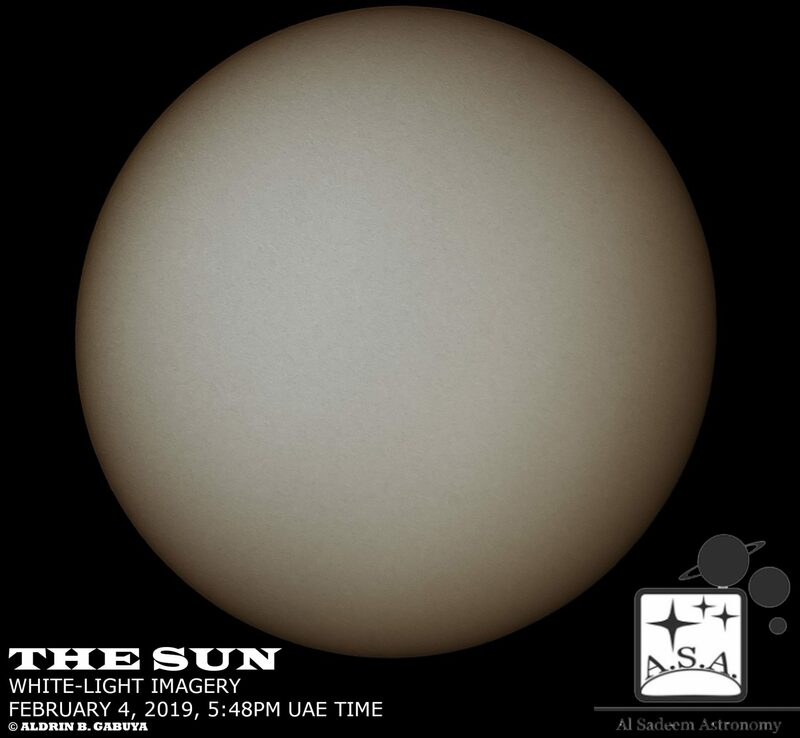 The Sun remains spotless as generally very low solar activity has persisted over the past 48 hours. No significant flaring activity recorded. The latest sunspot number (based on visual count and Wolf number calculation) is 0. Equipment used are Skywatcher 120mm refractor telescope with Baader filter and unmodified Canon EOS 1D Mark IV DSLR camera for visible imagery mounted on Skywatcher EQ6 Pro. Pre-processing of visible solar images was performed in PIPP, stacking in Autostakkert, slight wavelet adjustments in Registax 6 and post-processing in Adobe Photoshop CC.